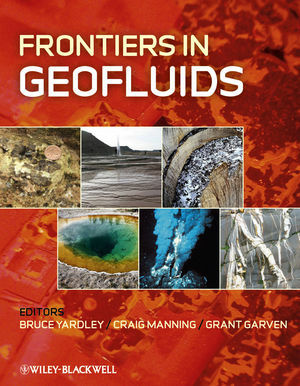 Frontiers in Geofluids is a collection of invited papers chosen to highlight recent developments in our understanding of geological fluids in different parts of the Earth, and published to mark the first ten years of publication of the journal Geofluids. The scope of the volume ranges from the fundamental properties of fluids and the phase relationships of fluids encountered in nature, to case studies of the role of fluids in natural processes. New developments in analytical and theoretical approaches to understanding fluid compositions, fluid properties, and geological fluid dynamics across a wide range of environments are included. A recurrent theme of research published in Geofluids is the way in which similar approaches can be applied to geological fluids in very different settings and this is reflected in the diverse range of applications of fluid studies that are included here. They include deep groundwater flow, hydrocarbons in faulted sedimentary basins, hydrothermal ores, and multiphase flow in mid-ocean ridge systems. Other topics covered are geothermal waters, crustal metamorphism, and fluids in magmatic systems. The book will be of great interest to researchers and students interested in crustal and mantle fluids of all sorts. Bruce Yardley is Professor in the School of Earth and Environment at the University of Leeds, UK, and was a founding editor of the journal Geofluids. His research concerns the nature and role of fluids in the crust, including metamorphic processes, hydrothermal ore systems and sedimentary basins. He obtained his PhD at the University of Bristol in 1975, and has been at the University of Leeds since 1985. He held a Harkness Fellowship at the University of Washington, Seattle, and has recently been a Humboldt Awardee at the Deutsches GeoForschungZentrum, Potsdam. Craig Manning is a Professor of Geology and Geochemistry in the Department of Earth and Space Sciences at the University of California Los Angeles. He received BA degrees in Geology and in Geography from the University of Vermont, and MS and PhD degrees in Geology from Stanford University. His research focuses on experimental and theoretical study of geologic fluids at high pressure and temperature. Grant Garven is a Professor in the Department of Geology and in the Department of Civil & Environmental Engineering at Tufts University, near Boston. Originally trained as a field geologist in the Canadian Shield, his career has mostly focused on mega-scale groundwater flow in sedimentary basins and related geologic processes. He received his BSc in Geology at the University of Regina, MS in Hydrology at the University of Arizona, and PhD degree at the University of British Columbia. Frontiers in geofluids: introduction (G. Garven, C. E. Manning and B. W. D. Yardley). Aqueous fluids at elevated pressure and temperature (A. Liebscher). Thermodynamic model for mineral solubility in aqueous fluids: theory, calibration and application to model fluid-flow systems (D. Dolejš and C. E. Manning). Metal complexation and ion association in hydrothermal fluids: insights from quantum chemistry and molecular dynamics (D. M. Sherman). Role of saline fluids in deep-crustal and upper-mantle metasomatism: insights from experimental studies (R. C. Newton and C. E. Manning). Potential of palaeofluid analysis for understanding oil charge history (J. Parnell). Spatial variations in the salinity of pore waters in northern deep water Gulf of Mexico sediments: implications for pathways and mechanisms of solute transport (J. S. Hanor and J. A. Mercer). Faults and fault properties in hydrocarbon flow models (T. Manzocchi, C. Childs and J. J. Walsh). Hydrostratigraphy as a control on subduction zone mechanics through its effects on drainage: an example from the Nankai Margin, SW Japan (D. M. Saffer). The interplay of permeability and fluid properties as a first order control of heat transport, venting temperatures and venting salinities at mid-ocean ridge hydrothermal systems (T. Driesner). Using seafloor heat flow as a tracer to map subseafloor fluid flow in the ocean crust (A. T. Fisher and R. N. Harris). The potential for abiotic organic synthesis and biosynthesis at seafloor hydrothermal systems (E. Shock and P. Canovas). Permeability of the continental crust: dynamic variations inferred from seismicity and metamorphism (S. E. Ingebritsen and C. E. Manning). Hydrologic responses to earthquakes and a general metric (Chi-Yuen Wang and Michael Manga). The application of failure mode diagrams for exploring the roles of fluid pressure and stress states in controlling styles of fracture-controlled permeability enhancement in faults and shear zones (S. F. Cox). Rates of retrograde metamorphism and their implications for crustal rheology (B. W. D. Yardley, D. E. Harlov and W. Heinrich). Fluids in the upper continental crust (Kurt Bucher and Ingrid Stober). Fluid-induced processes: metasomatism and metamorphism (A. Putnis and H. Austrheim). Fluid flows and metal deposition near basement ⁄cover unconformity: lessons and analogies from Pb–Zn–F–Ba systems for the understanding of Proterozoic U deposits (M.-C. Boiron, M. Cathelineau and A. Richard). Magmatic fluids immiscible with silicate melts: examples from inclusions in phenocrysts and glasses, and implications for magma evolution and metal transport (Vadim S. Kamenetsky and Maya B. Kamenetsky).